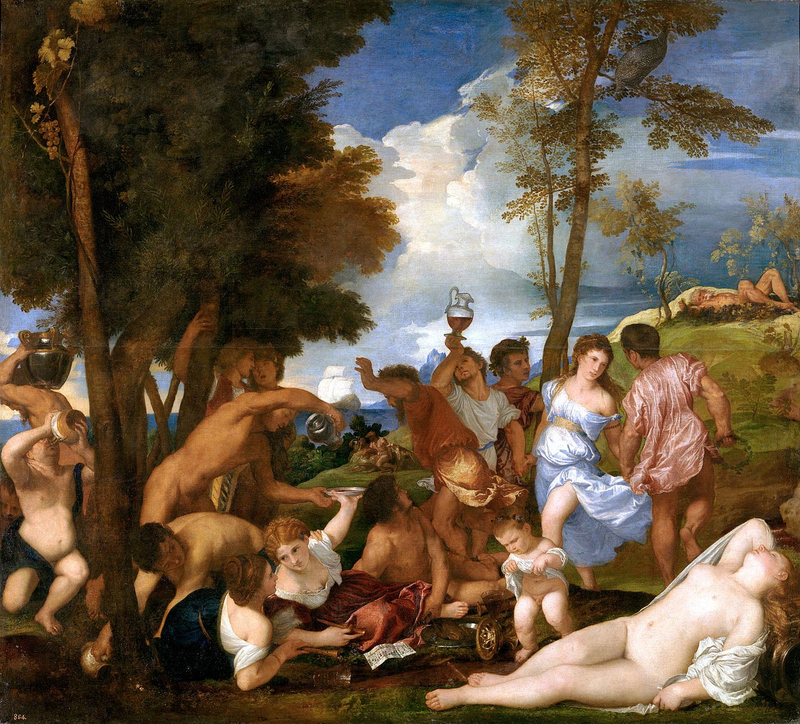 Above: “Bacchanal of the Andrians” by Titian (1490-1576) in the Prado Museum (image via Wikipedia Creative Commons). See this label entry on the Museo del Prado website. Click the image for higher resolution version. That’s the closing line of one of the bios of one of my students at the University of Gastronomic Sciences in Pollenzo (Piedmont), where I will be delivering two lecture series next week for the Master’s programs. The university was founded in 2004, the organic outgrowth of the historic Slow Food Movement. I can still remember like it was yesterday: during my first year at university in Italy (Padua) in 1987, I made my first trip to Rome where I saw the mega-sized McDonald’s at the foot of the Spanish Steps (Trinità dei Monti), opened the previous year. To a 19-year-old wide-eyed kid in Italy for the first time, it seemed as incongruous as obscene, a non sequitur in its surroundings and an oxymoron in its cultural setting. According to legend, the Slow Food movement was inspired, informed, and shaped by a desire to counter the fast-foodization of Italy. And the opening of the McDonald’s in Rome’s historic center became its battle cry. Today, some 30 years later, the Slow Food ethos continues to drive more than one generation’s desire to achieve culinary self-awareness and gastronomic sustainability. Strive to make the world a better place to eat in: it could very well be the Slow Food university’s motto. The seminar I’m the most excited about is my “Wine in Boccaccio” series of talks. Wine plays a more important role in the Decameron than you might imagine. And in many ways, Boccaccio’s work represents a bridge that leads to the “new” wine culture of the Renaissance. Of the “three crowns” of Italian literature in the Middle Ages, most point to (my beloved) Petrarch as the “first humanist.” Some even call his predecessor Dante a “proto-humanist.” But both Petrarch and Dante are wary of wine and reluctant to even discuss it. It’s in Boccaccio’s work that enogastronomy is distilled (or rather fermented) into a new science, a new knowledge, and a new self-awareness absent in Dante and Petrarch. And wine in the Decameron sets the stage for a new and heightened interest in wine in the coming renewal of learning — the Renaissance. In many ways, Titian’s painting above would not have been possible without the Decameron and a new conception of what wine is and what role it plays in the human experience and condition. Isn’t that painting above incredible? It depicts a Bacchanal on the island of Andros, where a river of wine flowed (click this link to read Philostratus’ description of the island [the link only works once in preview mode before you have to subscribe fyi]). The lyrics of the music in the foreground are: qui boyt et ne reboyt il ne seet que boyre soit (those who drink and don’t drink again don’t know what drinking is). The score and the painting were both composed at the height of the Renaissance at the court of Ferrara. The painter, composer, and courtiers were all intimately familiar with Boccaccio, whose works had been propelled to greater fame and fortune thanks to the advent of the printing press.